Located on a well-lit corner on of one of Inner Southeast Portland's most traveled thoroughfares, the Mobil Gas Station facing McLoughlin Boulevard at 5124 S.E. 17th Avenue seems a bit too well-observed for a robbery; but, on September 16, Central Precinct officers were called there at 8:10 p.m. by a station attendant who had been held up. "Officers learned that a suspect come to the location, and demanded the money from the employee, while brandishing a handgun; then, after obtaining cash, the suspect left the location southbound in a white sedan on S.E. McLoughlin Boulevard," reported PPB Public Information Officer Natasha Haunsperger. As officers spoke with the employee on duty at the gas station, an additional dozen units spread out to look for the vehicle, including the Bureau's "eye-in-the-sky" Air Unit. "Officers did not find anyone matching the suspect's description or vehicle," Haunsperger said. The suspect's description was vague, because the 6'2" man was wearing a black mask with sunglasses, and a gray hoodie. No surveillance images were made available. 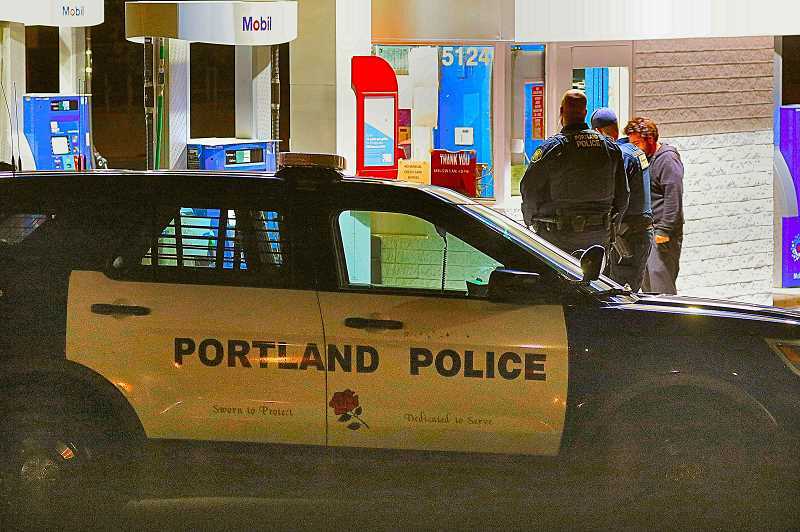 The case file is still open, and anyone with information about the holdup is asked to contact the Portland Police Bureau Detective Division's Robbery Detail at 503/823-0405.